One of the things I try to do to make sure we are practicing cutting edge physical therapy in our clinics is to look at what the top Universities and Professional sports teams across the country are using to rehab their injured players. I have had the opportunity to visit some high-end training facilities and always make a point of checking out the equipment and techniques the trainers and therapists are using on their athletes. Because there is huge money involved in athletic performance, it stands to reason that when a key athlete goes down the owners, trainers and therapists working with these athletes will use the very best therapy and rehab equipment at their disposal to help get their injured athletes healthy and back in action ASAP. One piece of equipment that is found in nearly every major college and professional sports team training room is the AlterG Anti-Gravity Treadmill. Many big time athletes have used this treadmill to speed their recovery and healing. I was so impressed with this treadmill that I purchased the first Alter G in Southern Utah for our St. George clinic. It has been so successful we hope to add one to our Mesquite clinic soon. The technology for the Alter G Treadmill was originally developed at NASA as part of an effort to help astronauts maintain fitness during prolonged space flight. AlterG combined this technology with an advanced pressure regulation system and a treadmill to produce the first anti-gravity treadmill. 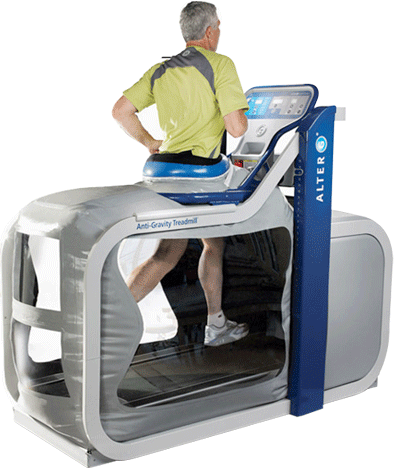 AlterG is the first company to use a pressurized enclosure to provide a counterforce to the person’s body weight, reducing their effective weight on the treadmill surface. The Alter G treadmill looks a little intimidating at first but is actually surprisingly simple to set up and use. The first step is to get into a funny looking fitted pair of neoprene shorts which has an upper skirt which zippers into a plastic casing forming an airtight environment. As you stand on the treadmill it calibrates the machine to your exact weight. The machines plastic casing around the treadmill fills with air and using it’s unweighting technology can create a reduced pressure environment from 0-80% unloading of your body. This means that if you you weigh 200 pounds, you could feel as light as 40 pounds on the treadmill! You then walk or run in the un-weighted environment. 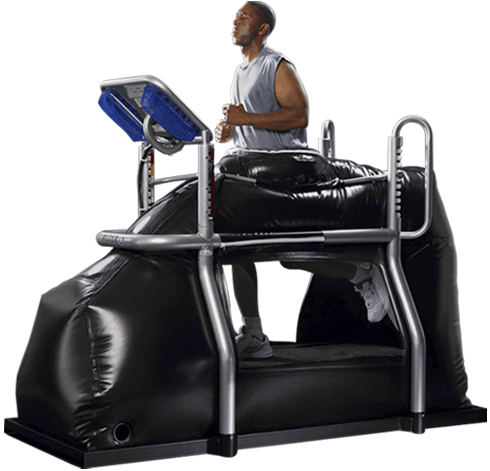 The Alter-G can be utilized by both athletes and the general population, and can assists in rehabilitation post-injury or post-surgery. It is perfect for individuals who suffer from a lower extremity injury, like an ACL reconstruction, hip or foot and ankle injury. Whether someone is post-operative or trying to prevent surgery, the Alter-G can be used to reduce the impact on joints to provide both strength and aerobic conditioning. Even stroke patients can benefit as the treadmill can help retrain their legs and brain with supported movements. Non-injured athletes have also found ways to utilize the Alter-G before and after endurance events. Runners might consider an Alter-G run to log a few miles without the impact before a marathon, or conversely as a tool for recovery after a long race. But for runners facing months of injury rehabilitation without logging any miles, the Alter-G provides a way to move again – stimulating both the muscles and the mind toward recovery. For more information about the amazing Alter G Treadmill visit alterg.com or visit our St. George clinic for a free demonstration.